Let your friends and family relax in comfort while enjoying cocktail and snacks on this Malibu Outdoor Patio 5-foot Wood Garden Bench with full-back, sounds perfect! Made from 100% Eucalyptus - a very durable Hardwood, this bench can stand up to all kinds of changes in the weather. The pores of the Eucalyptus is very dense; thereby it quickly repels water, and its natural oil combats and repels wood eating insects. Comes in the beautiful Natural Wood Finish, this will be a great addition to your outdoor patio! The classic elegance of the Branco Bench belies its capacity to store outdoor pillows, warm throws for chilly evenings and all of the accoutrements that bring ease to outdoor living. Crafted of acacia wood and galvanized steel for ease of care. Inspired by the intricate detailing on Victorian homes, the fanciful ironwork on this antique white outdoor bench is so pretty youll want to bring it inside. From outdoor porch to indoor foyer, this bench has all the character of a flea market find. This is a great addition to your home whether in the country side or busy city. Malibu 5 ft. Slatted Back Wooden Patio Garden Bench Let your friends and family relax in comfort while enjoying cocktail and snacks on this Malibu Outdoor Patio 5-foot Wood Garden Bench with full-back, sounds perfect! Made from 100% Eucalyptus - a very durable Hardwood, this bench can stand up to all kinds of changes in the weather. The pores of the Eucalyptus is very dense; thereby it quickly repels water, and its natural oil combats and repels wood eating insects. Comes in the beautiful Natural Wood Finish, this will be a great addition to your outdoor patio! 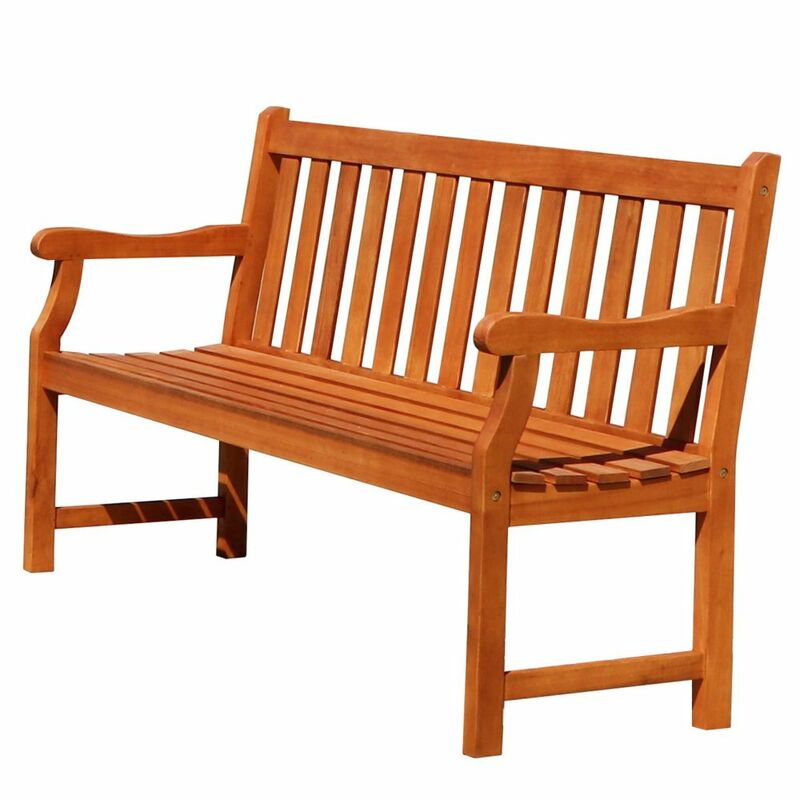 Malibu 5 ft. Slatted Back Wooden Patio Garden Bench is rated 3.9 out of 5 by 28. Rated 5 out of 5 by Ralphsee from NICE STURDY BENCH. ASSEMBLY WAS EASY. GOOD VALUE COMPARED TO OTHERS I LOOKED AT. NICE STURDY BENCH. ASSEMBLY WAS EASY. GOOD VALUE COMPARED TO OTHERS I LOOKED AT. Rated 5 out of 5 by Janice from The bench was easy to assemble, looks great & was... The bench was easy to assemble, looks great & was a much better price at Home Depot than other on-line sites. Rated 3 out of 5 by Rob from Starter holes not drilled large enough maybe, Hardware was definitely not adequate. Still, after ... Starter holes not drilled large enough maybe, Hardware was definitely not adequate. Still, after over a week, waiting for new hardware to come when they said it would be sent right out. Rated 1 out of 5 by HomeDepotCustomer from Ordered 2 so far and both have arrived damaged. It's... Ordered 2 so far and both have arrived damaged. It's getting very frustrating. The damage is not from shipping. Rated 5 out of 5 by Steve from Easy to assemble and looks great.... Easy to assemble and looks great. Please confirm the &quot;assembled item&quot; is the final product and item depth/height etc. is for the packaged item. The listed dimensions are for the final assembled product and excludes all packaging.